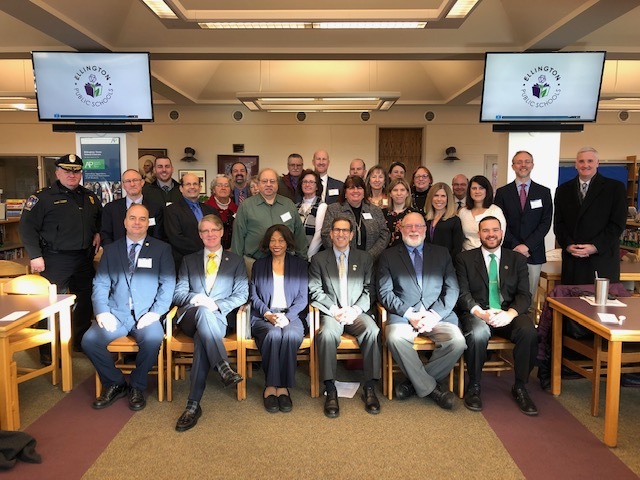 ELLINGTON – State Representative Christopher Davis (R-57) attended the January 15th legislative breakfast hosted by the Connecticut Association of Boards of Education (CABE) Region 3. Board of Education Members, teachers, administrators and legislators from across the region discussed the major issues impacting schools in the 2019 legislative session. The school district leaders shared their concerns about forced school regionalization and the need for consistent education cost share funding from the state. Also discussed at the meeting was Rep. Davis’ proposed legislation HB 5988 ‘An Act Concerning the High School Graduation Date’ which would allow schools to set fixed graduation dates. The proposal has received bi-partisan support and has been referred to the Education Committee for consideration. Read more about the proposal HERE.